Anyone want to try in their own country whether they (Exedy/Daiken) can supply? 1 Super RHD Semi-Auto "Klaus"
I asked EXEDY Australia, and the plate and pressure plate are available but the T-O bearing is listed as "Discontinued". 3151-135-030 Throwout Bearing for a VW Type 1 1500 with Hydrodynamic Torque Converter is available. For what's its worth I cracked open my throwout bearing to lube it with Li/MoS grease yesterday. No big deal, the housing comes completely apart with little effort. It seems odd to me that a replacement bearing would not be available, if not from the typical auto houses, then from a bearing supply house/machinery supplier. The bearing proper doesn't look any different from other bearings, with inner and outer races, and a 'cage' for the ball bearings themselves. Should be a typical press in, press out type of job. The 'fingers' Lee is talking about are part of the bearing housing and those of course would be unique to the VW AS, but the guts ought to be replaceable. Mine had F&S markings with a model no. but I didn't make a note. It just didn't look like a big deal. If anyone is REALLY interested and it's worth the effort I can R&R it to get the numbers - not to late yet, it's still on the bench. Do it!!! Is it a torrington or proper ball race jobbie in there? I nearly took mine apart but didn't have a strong enough snap ring pliers! I don't know what you mean by a 'torrington' vs. a proper ball race. I should have taken a pic...the whole box is altogether now and ready for paint! But I think the latter. But it's as I say: there is an inner race and an outer race, not tapered races like you see for wheel bearings, just flat and the faces are parallel to the bearing axis. The balls are captured in a simple polymeric cage which appears to press in from one side. The bearing assembly w/races is then pressed into the main TO bearing assembly piece, and then some thin metal covers pressed over top on each side to hold the grease in. When I first examined it, it appeared that these covers were one piece. But I took a sharp utility knife and found the edges, and after running the blade around the piece was able to get behind them and separate them easily, exposing the bearing. This made it very easy to clean the bearing, races and cage, and reapply more lube. If these assemblies are all pretty much the same I don't know why anyone couldn't do this, it didn't require any special tools, just a set of snap ring pliers. On that, once I got a little separation going I was able to get a screwdriver behind/under the ring and pop it off. I'm moving on with this but here is what I will do. It's not a big deal, now that I know how to do it, to strip the clutch housing from one of my other boxes, fetch the TO and crack it open. I'll let you know how this works out. I have to correct myself on the above post. It's not a simple bearing that could be removed and replaced, rather it is a bearing that appears to be unique to the application as a release bearing. 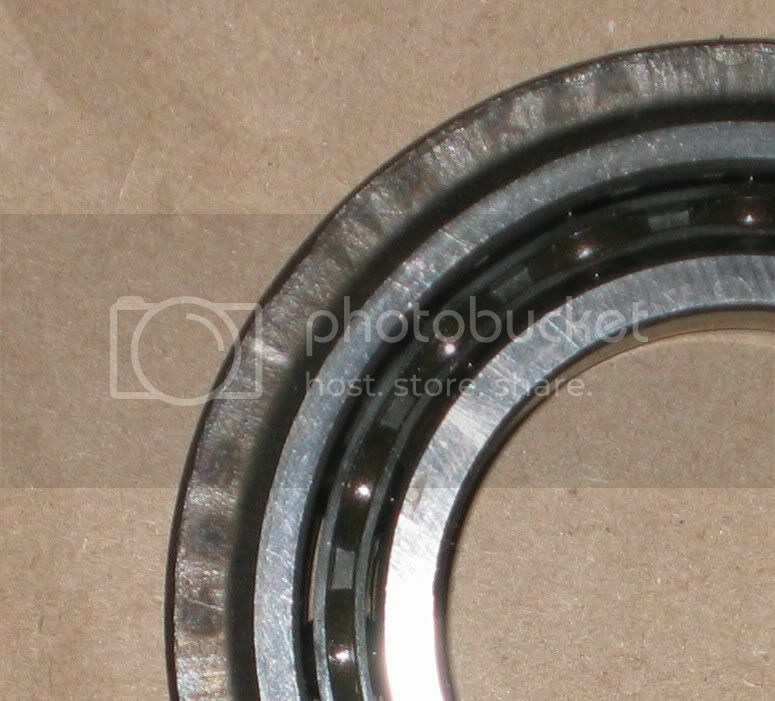 In this first pic you can see the release 'fingers' removed from the inner bearing race. 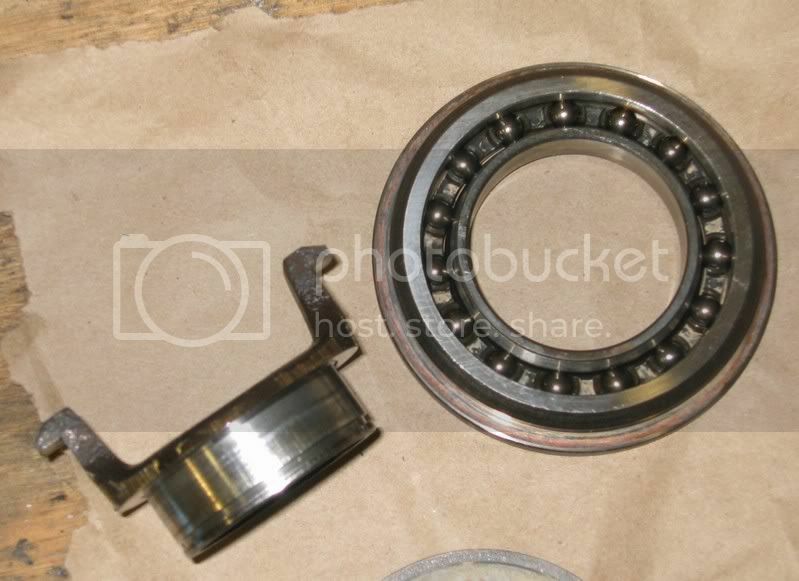 In this second pic you can see the callout for the bearing: "F&S TYP KZA"
I hope this helps. I've already done some searching online, but no luck for a replacement. If I got it correctly, F&S eventually became Sachs, the clutch manufacturer. A more or less standard ball race type! Did you measure ID, OD and width? That's about the only way to search various bearing houses lists. The only other thing I can think of is the numeric designation stamp may be on the inward facing part of the outer race :? seems its a parallel bearing like 6206 2RS or LLU..
but maybe, if a bearing was close enough the inner and outer piece may be machined to fit?? You would think that manufacturers would use bearings that were readily available, instead of making special ones...?? I did not but I can easily enough. I assumed that there would be cross reference charts somewhere that would give the equivalent from SKF, Timken or other bearing mfr. As I dug into this, it seemed that this was not a 'standard' ball bearing but a specialized release bearing because of the outer race configuration, and that the normal bearing mfrs might not have a replacement. I think this has to come from a clutch mfr - Borg Warner, perhaps, or Sachs themselves. Now having said that, you have to hope that, if the mfr was OEM, they did not destroy the pattern and/or continue to make that particular bearing. If we are lucky it would be used on another period vehicle, but that's a stretch. If the mfr is not OEM you have to hold that hope out as well, as it would not do them to tool up for a run of a release bearing that didn't have much of a market - such as ours. I don't see any other callout - even using my trusty 1.5X magnifiers - for a numeric designation. I didn't realise that the outer race formed part of the release mechanism. I thought it was a three piece, ie inner bit with "ears", bearing & then outer housing. That certainly changes things (probably for the worst) as far as looking at where one would get some sort of replacement. Checking out my spare T-O bearing and opposite the "F & S TYP KZA" are the numbers 56136001 followed by 10 "upside down triangle" 67 which I'll assume means month/year of production. I know similar questions get asked all the time and get promptly knocked down, but let's play devil's advocate. What would be a good guess for the costs for blueprinting/a small production run (50?) of such a bearing? 001 141 165...Release Bearing for Automatic possible this will help. Secondly ThePartsBin.Com has both the 001 301 083 ( before 8/69) Converter seal ~18.00 USD and the 001 301 083B Seal ( 8/69 - onwards) about 24.00 USD .